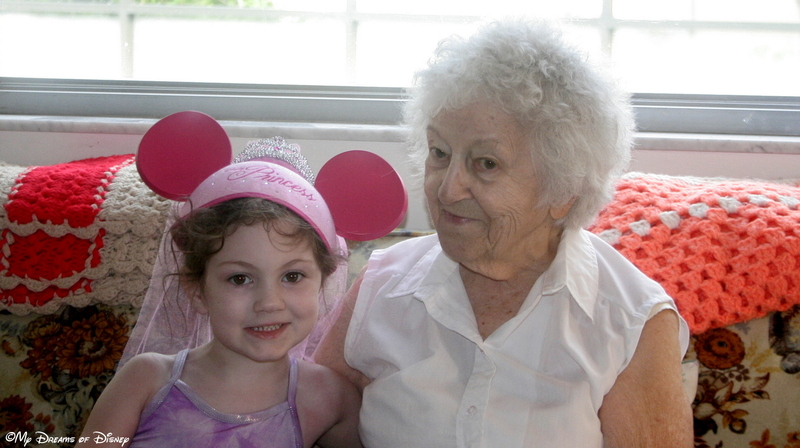 Sophie with her Nana, 2006. Welcome to this week’s edition of Friendship Friday! Last week we focused on my Grandpa, and this week we focus on his bride of nearly 68 years, my Grandma! My Grandma was born Edna Atwood near Waterbury, Connecticut, and was one of the children of a local vet in the area. Since the area she lived in was mostly farming, she learned to ride horses early on. It was during this time that my Grandpa met my Grandma, and began a romance that would last for a lifetime. I have heard a lot of stories about my childhood from my Grandma, perhaps my favorite one was the time — when they lived in Buffalo, NY — when my Grandma bought me a hotdog with ketchup, and told me to make sure I held onto that hot dog really tight. Well, I held it so tight that the hot dog shot out of the bun onto the floor! My Grandma and Grandpa are a blessing in my life, even now, despite the fact that they have both been called to Heaven. My Grandpa used to make my Grandma so angry! He told us the story once that her family was wealthy — so wealthy that they had servants! The true story is that my Grandma’s mom passed away really young, and my Grandma — who was the oldest if I remember correctly — had to keep the house because of that. In order to help them out, they did have a lady who came by to help with the housekeeping, but it wasn’t at all like they had servants! Sophie was born when my Grandma was 87 years old, and it was extremely important to Cindy that we bring Sophie down to Florida to meet Grandma and Grandpa as early as we could. As a result, little Sophie took her first trip to Florida at the tender age of 7 weeks old. We had already planned on staying at a hotel, so we checked in first and settled in before coming over. I remember as we were heading to my Grandma’s house that it started pouring rain! Grandma knew we were on our way because we called first, and when we got there, Grandma was waiting in the garage with the door open, umbrella at hand, waiting to help Cindy and Sophie get into the house. My Grandma was the rock of our family, especially after they retired. Grandpa was stricken with pancreatic cancer — and survived it — but he also had macular degeneration and hearing loss, so he wasn’t able to drive anymore. My Grandma did all the driving when it was just the two of them, she had the greater energy, and she did her crossword puzzles. They watched their baseball games on TV together, and they did all of these things together. In the end, though, it was my Grandma who would end up having the frailer body. Grandma passed away in March 2007, just a few days before her 93rd birthday. After she passed away, Grandpa moved to Virginia with Mom and Dad. I’m going to close with two pictures from after Grandma passed away. In the first you have my Grandpa and Mom, Father and Daughter, doing what they did best — taking care of one another. 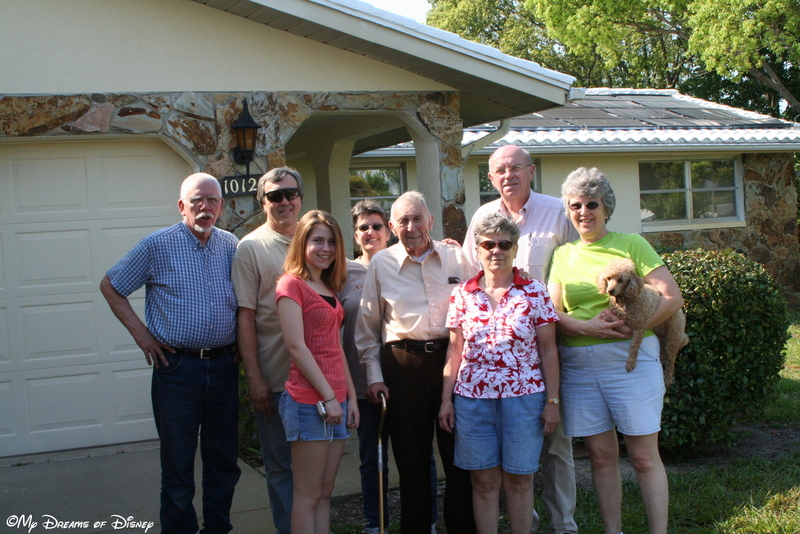 In the second picture you have a family picture in front of Grandma and Grandpa’s house in Florida. 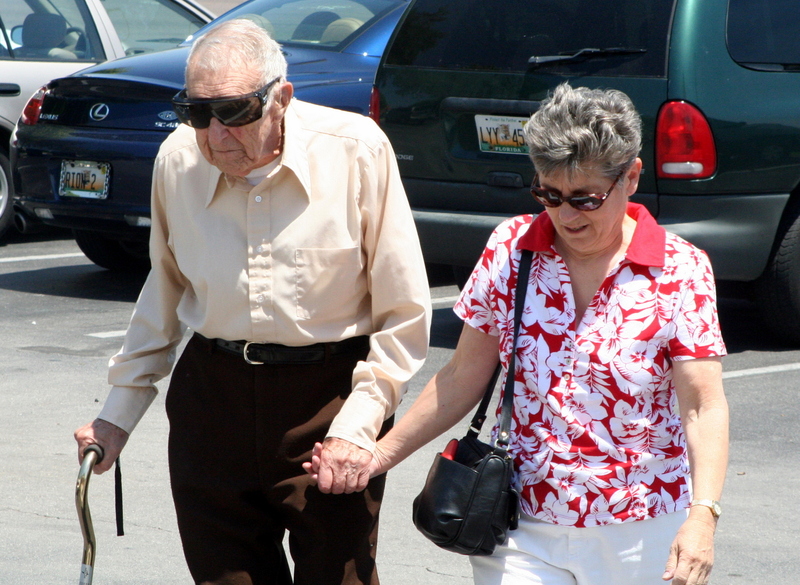 Grandpa and Mom, holding hands, after Grandma’s Memorial Service. At the end of this long post, I urge you all, if you still have your Grandparents in your life, to take a moment, pick up the phone, and give them a call and tell them you love them. Or, if they are close enough, go over and visit with them. All of my Grandparents are now in Heaven, and I miss them. Looking at the pictures in this post, the memories return anew, and I found myself wiping tears from my eyes that I thought had all been shed. I never realized in the picture of my Mom and Grandpa just how prophetic that picture was. Grandpa looked after Mom and helped her to learn to walk and talk again, and now, in his later years, my Mom was there for him, taking him by the hand, helping him when needed, and yes, getting aggravated by him as much as my Grandma was at times. Remember, take a moment, give them a call or stop by and see them. You are blessed to have them, just as those of us that have lost our Grandparents were blessed to have them. Never take them for granted, any of our family members. This series is the brainchild of my friend Heidi from Heidi’s Head! To take a look at who she is featuring this week in her post, just click on the image below! Thanks for stopping by! Mike~ I’m looking forward to meeting your grandparents in heaven! They both sound like amazing people! I agree with you – I’ve lost all 4 of my grandparents now – and I always tell people who still have them to appreciate each and every day. Thanks for sharing in my friendship series. What a lovely tribute to your Grandmother and to your family. I love the “hold onto the hot dog” story, so cute. I can imagine the surprised look on your face! I imagine that that stage in my life the surprised look quickly turned into a temper tantrum! Shoot, that probably would happen now too! :) Thanks for reading and commenting!